This is seriously a fantastic comic, and I appreciate that you put it online for free. It’s really great. foxtrot, foxtrot… These are all signal flags. I didn’t pick up on that book looking like foxtrot at first, but now I see it. So this comic is about some sailor who’s slowly going mad? Or who’s trying to stop being mad? I really enjoy what we’re seeing of Charlie’s personality shining through here. Or rather, the way we’re seeing it shine through, and how he sort of dominates this page, as opposed to the Diver, who we see in the last panel. Charlie, while sympathetic to the Diver and as an aspect of him (as he claims to be), is trying to figure out what has gone wrong, with something almost like disregard to the obviously somewhat confused state of the diver. Though this interpretation of Charlie’s personality could just be an artifact of seeing a page at a time. 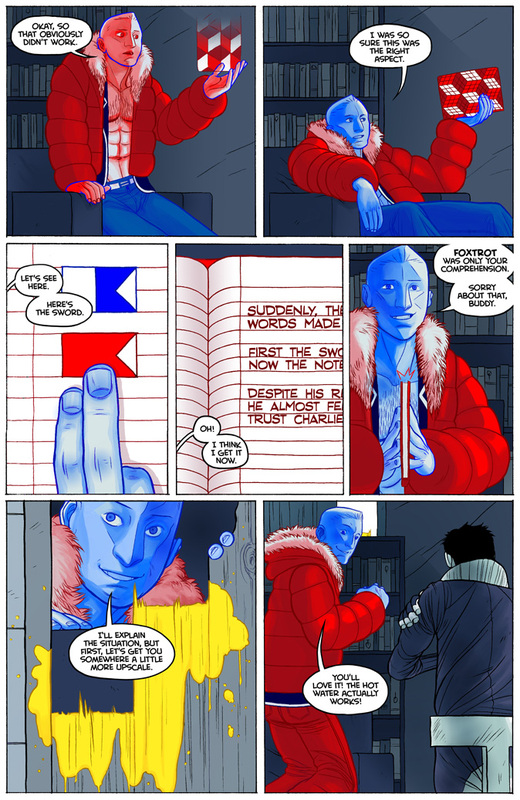 On another note, I have always enjoyed the use of color and the monochromatic blue color scheme with the splashes of bright colors, it wasn’t until the first panel of this page that it really struck me how Charlie is outlined with blue, as opposed to the red he was before depositing the book into The Divers chest, and the black of Diver. And, now that I think about it, the yellow of the bear, and the blue of the bird as well. I hadn’t really considered it until this point, but it is a touch that I really enjoy. Haha well, I’m glad I, as a reader, can satisfy you as well. Thank you for the comic! I’m really loving it. This is a fantaaastic comic! My graphic novel class is anxiously following along! Awesome! I hope not to disappoint. I seriously doubt you could. I really like Charlie as a blue man. Not entirely sure why but I think the red was too jarring. Although I don’t know why blue would be less so. Also, why are his pants red in the last panel? Will Charlie just continuously change colour to confuse me? Red pants, blue pants, white pants. You know how it is! I just found this, and it’s absolutely wonderful! I’m glad I have the Wikipedia article on maritime flags open in another tab, since the flag meanings add a lot of extra depth. I like how you incorporated the Foxtrot flag into the book cover. Extra bonus is your gravatar being Foxtrot, too!